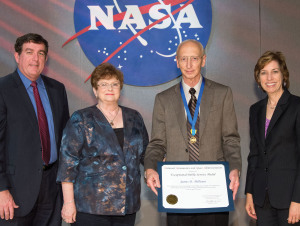 Johnson Space Center Director Dr. Ellen Ochoa, right, and Deputy Director Kirk Shireman, left, present James Milhoan the Exceptional Public Service Medal at a public event held in September. Pictured with the honoree is his wife, Ione Marie Milhoan. Johnson Space Center Director Dr. Ellen Ochoa presented Barrios Technology’s James Milhoan with NASA’s prestigious Exceptional Public Service Medal during a public ceremony – recognizing him for his 45 years of dedication and service supporting NASA and its important missions such as Apollo, Space Shuttle, X-38 and Multi-Purpose Crew Vehicle. Milhoan, recognized as a national expert on reentry materials and systems, has supported thousands of tests performed in NASA’s experimental test facilities, including the Arc-jet and Radiant Heat Test Facility. “We are extremely proud to have James as part of the Barrios team. He represents the very core value of what Barrios provides to its customers. I congratulate him for his excellent career solving NASA’s technical challenges associated with the re-entry of all human spaceflight vehicles and thank him for his dedication to NASA’s programs,” Barrios President and CEO Sandy Johnson said. Kemah City Council has appointed former Kemah Mayor Greg Collins to fill a vacancy on the City Council. He replaces Councilman Steve Mewborn, who resigned his Position 5 seat during the meeting. Mewborn resigned to become a deacon at his church. Collins served two terms as Kemah’s mayor after being elected in May 2005. Prior to that he served on City Council. Non-violent first-time offenders caught with up to two ounces of marijuana will be offered a chance to avoid jail and being charged under a program announced Oct. 1 by the Harris County district attorney. Instead, they will be offered a chance to successfully complete eight hours of community service or complete an eight-hour class. Otherwise, they could face the maximum penalty of 180 days in jail and up to a $2,000 fine. The program took effect Oct. 6. In 2013, the office processed more than 43,000 Class B misdemeanor cases — the majority of which were for possession of marijuana.